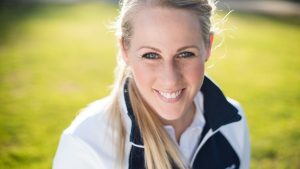 In 2011, Caroline Larsson was a young woman of 22 from a small Swedish community, quietly focused on the start of her professional golfing career, with a loving family where three generations of Larsson had been running the local food store. 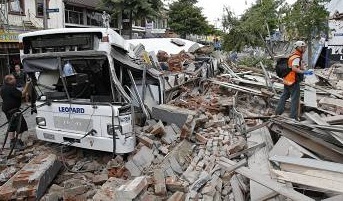 You would thus assume that being caught up in the notorious earthquake in Christchurch, New Zealand (6.2 on the Richter scale) – where Caroline found herself literally running for her life as 185 people died – would be the most traumatic event she faced in the early part of that year. But it wasn’t. A matter of weeks afterwards, after struggling with a bad knee off-and-on, Caroline Larsson learned from her doctor that she was suffering from a rare form of bone cancer and it was aggressive. Amputation from above the right knee was her only solution. That Caroline was able to centre herself after this shattering news, to come into hospital just three weeks later, the day before the operation, shake hands with her surgeon and make a deal that he would “take my leg and give me back my life”, speaks volumes of her mental and physical courage. And knowing that her positive attitude was shaped by learning from her golf, that her golf experience actually helped her deal with this crisis, will cause anyone to pause. The leg that would actually be amputated helped propel Caroline to safety, after she and her sister Louise had been enjoying lunch in a Christchurch restaurant in February 2011. During the first “big vibrations” it seemed that the staff had turned the music volume up too high, but in the slow seconds that followed it was all about instinct. The sisters had to wait several days to get flights out of Christchurch. Louise’s flight was first and Caroline faced more anxious hours in the airport as another quake hit the city area, her flight might be cancelled; nervously watching on airport TV the “surreal” pictures of the neighbourhood where they had eaten lunch. Being young and strong and only focused on one thing in the year before the quake – golf – she did well to not let it dominate her thoughts.The year 2010 was one of preparation for golf. “Practising, eating and sleeping, that was my only focus for a year,” explains Caroline. Sacrifices had to be made, the popular girl known as ‘Carro’ to friends and family was choosing golf as her career. An ideal fit for someone who has loved golf ever since first visiting Forshaga Golf Club with her father when eight years old, tricked into trying a little golf with the promise of an ice cream. But Caroline loved the team element of Floorball (a kind of indoor ice hockey without the ice and skates) and though golf is a solitary sport while you’re hitting the ball, Caroline would always be playing or practising with someone, she was never the solitary golfer. Thankfully, both this love of the inclusivity of the team and the mental resilience learned on the golf course would help her through when a doctor sat her down. She was expecting encouraging words about her knee injury, but Caroline would hear the words “cancer” and “amputation”. When you hear Caroline talk today, her voice is strong, bright, with intelligence, humour and imagination shining through. Amazing to hear someone speak so well and to learn that she is now making a living from public speaking, seven years after the trauma of 2011. “As I was thinking my career was in focus and ready for the Ladies European Tour, It was like somebody just crashed those pictures into a thousand pieces,” says Caroline. “Everything was gone, everything I believed for the future was gone. It was only a few weeks before when I was in the earthquake and back then I didn’t remember thinking anything, and it was the same here receiving the cancer diagnosis, and the picture just crashed. She was given three weeks before surgery. Gathering herself, Caroline sat down in a quiet spot with nature all around and phoned her Dad. She had the presence of mind to get her parents together at home so she could break the news in person. “That was so emotional because of course they were not expecting anything like that to come into our lives. Since we were open about our feelings from the beginning it was much easier to work through that anger, frustration, also thankfulness, fear or happiness, together. Again, when talking about coping, Caroline refers to the mental strength acquired through golf. 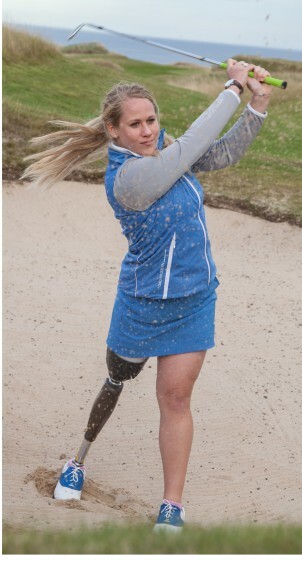 She found herself using the same visualisation techniques, formerly for feeling comfortable under pressure when arriving on that first tee, now towards when she would have to walk through the doors of the hospital and wait for surgery. This capacity to focus, borne out of golf, would lead to that handshake with her surgeon. She had managed to control those first tee nerves. Yes, her legs shook on that last walk on two legs to the hospital, but Carro was ready. Five days after surgery Caroline was in the hospital’s rehab wing for the first time and she spotted a golf club in there. Thinking that if she could swing the club a little it would be a positive omen, “I asked the nurse to take a picture and she thought I was crazy and when I dropped my crutches I think she wasn’t breathing! 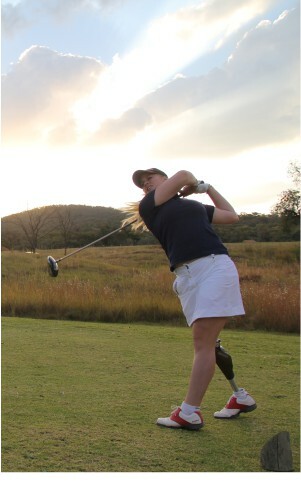 Buoyed by the thought she may be able to play again she looked online and typed in ‘one-legged golfer’ and soon found herself watching the video of EDGA golfer Manuel de los Santos from the Dominican Republic, who had lost his left leg after being hit by a motorbike before even taking up golf and now plays to a very high standard. The first time she tried to hit balls on the range she could only manage 10 shots before being too tired, but could already see that she could make a good contact and “fly the ball”. The Swedish championships were only two months after her surgery but Caroline aimed for that date to play competitively again. She worked hard on her physical rehabilitation and her coach Fredrik Eliasson backed her even though he was concerned whether she could make it. 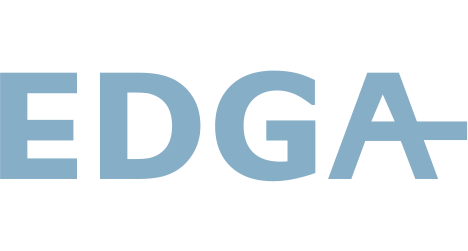 “He didn’t tell me of his concerns, just supported me, and this was a huge success factor. That was just the start of her return to competitive golf. 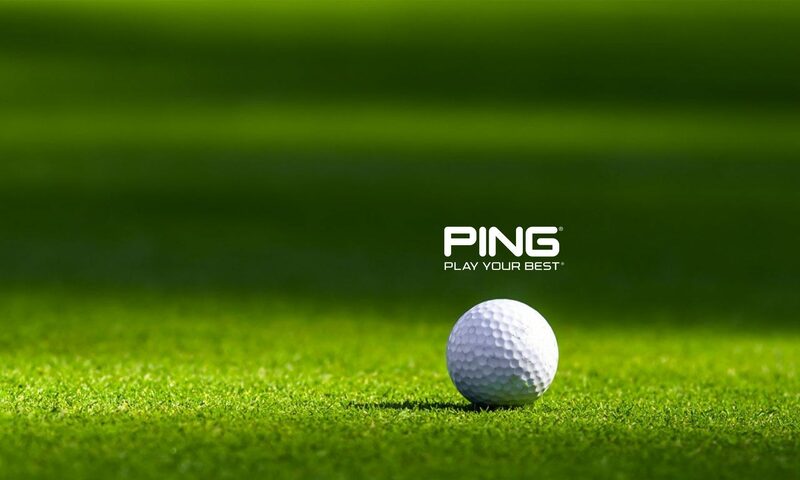 Caroline was able to reproduce much of the timing, balance and power from before her surgery and confidence flourished as the joy of golf once again started to consume her. Fast forward just a little and Caroline Larsson’s name is engraved on the winner’s trophy of the (then EDGA) European Individual Championship for 2012 and 2014. Perhaps this competitive success proved something to Caroline about surviving the trauma of the loss of her leg. Certainly that love of team had remained much in evidence since 2011 and little by little she was changing course as she started to find that public speaking was helping herself and other people. And playing golf, playing that first tournament back with her sister, played such a big part. The result of this change has meant the end of her competitive golf with EDGA, and her fellow players do hope to see her on the fairways again, but it’s the start of a new chapter which is seeing Caroline offer inspiration and positive and practical support to help companies and sports teams to get more out of themselves and reach their potential as groups and individuals. While very confident now on the stage with the microphone, it has taken seven years to get there, with her fair share of slips that will beset anyone speaking to audiences. Caroline is an Ambassador for Allianz and also a supporter of the Swedish charity the Star for Life Programme. Thoughts and advice for others who may be nervous about speaking in public? Certainly Caroline was speaking from her heart when she ran an event for the Star for Life programme last year. 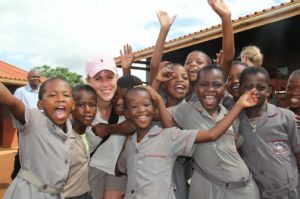 One of Caroline’s dreams has been to finance a primary school in South Africa within the Star For Life Programme, whose aim is to provide education to children and young people in the most vulnerable areas regarding HIV and AIDS in South Africa. It was during her first trip to the KwaZulu-Natal area when Caroline was touched by the children and their desire to achieve their dreams, despite all the miseries that surrounded them. Caroline did not see any victims, rather “children with shining eyes that overwhelmed the visitors with love and gratitude” now they knew that they had a chance to make their dreams come true. Speaking on the night, Caroline hoped to raise €2.500 but the audience liked this dream of hers and €17,000 was raised, enough to pay for three years of education for the 430 South African boys and girls. Dreams and nightmares. Living a life seems to require both. But it is often trauma and major change that shapes character and forces a person to find their best qualities.